This beautifully set pendant has the look of fine jewellery without the price tag! 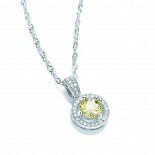 Beautiful Cubic Zirconia claw set captured in a crystal surround. Matching earrings available.